Pinellas Pediatrics | Specializing in the care of infants and children. Our office hours are 7:30-5:00 M-F. We have walk-in hours for sick children M-F 7:30-9:00 AM. We are located near Morton Plant Hospital @ 1105 S. Fort Harrison Ave, Clearwater, FL 33756. Please call us 727-461-3163. Measles is a highly contagious disease among persons who are susceptible. The Florida Department of Health investigates all individuals with measles who spend time in Florida while infectious, including residents and visitors. However, only Florida residents are included in Florida’s case counts reported to the CDC. Two Florida residents and one visitor with confirmed measles associated with international exposures in Brazil and France were investigated in July. The two Florida residents and were exposed to measles while traveling abroad. They had no measles vaccinations prior to exposure. The visitor was exposed prior to arriving in the United States and had unknown vaccination status. Thus far in 2018, a total of four Florida residents and three visitors with measles have spent time in Florida while infectious. Contact investigations are conducted for both Florida residents and visitors with measles to determine the vaccination status of those potentially exposed to measles and to detect and prevent transmission. In July, a total of 404 contacts who had possible exposure to measles were identified. No outbreaks of measles were reported. Contact investigations are important for every case of measles to determine the vaccination status for those potentially exposed to measles and to detect and prevent transmission. Vaccination is the best way to prevent measles infections.In July, the two Florida residents with measles were never vaccinated prior to exposure and the visitor had unknown vaccination status. In May, a total of 944 contacts were identified who had possible exposure to a case of measles. In 2017, all measles cases (n=3) were exposed to the measles virus outside of Florida. Vaccination is the best way to prevent measles infections. In May, two cases were never vaccinated against measles and two cases had unknown vaccination status. 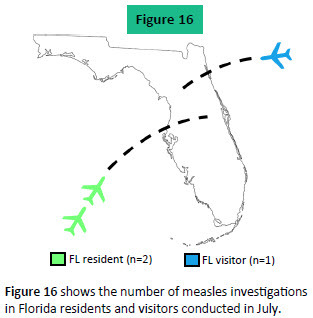 Due to generally high vaccination rates, cases of measles in Florida residents are rare but occur every year and are most often associated with international travel. To learn more about measles, please visit http://www.floridahealth.gov/measles. Even though measles has been eliminated in the United States, cases occur every year, mostly among unvaccinated individuals. As of July 14, the CDC has reported 107 confirmed cases of measles so far in 2018. In 2017, the CDC reported a total of 118 cases. In 2017, Minnesota experienced a large outbreak of measles in a community with low measles vaccination coverage that affected a total of 65 individuals. For detailed information on this outbreak see page 10. The two dose measles vaccination schedule has been successful at decreasing cases, and measles was eliminated from the United States in 2000. Recently, increased measles activity has been reported all over the world. In May 2018, multiple measles outbreaks were reported in the Americas, Asia, Africa, Europe, and the Pacific. The CDC has issued a Level 1 Travel Alert for several countries with measles outbreaks, including Greece, England, Serbia, Indonesia, Democratic Republic of the Congo, Italy, Ukraine, the Philippines, Romania, and France. Travelers to these countries should make sure they are vaccinated against measles with the MMR (measles, mumps, and rubella) vaccine. For more information, please visit https://wwwnc.cdc.gov/travel/notices. In 2015, more than 100 people from 14 states had been reported to have the measles. Most of the cases had been part of a large outbreak linked to an amusement park in California and a day care in Chicago. Five infants attending a KinderCare Learning Center in Chicago develped measles according to local news sources. The initial confirmed case reported visiting Disneyland Resort Theme Parks in Orange County, CA, from December 17 through December 20, 2014. From December 28, 2014, through January 21, 2015, 51 confirmed cases of measles linked to this outbreak have been reported to CDC, 42 from California and 9 from six other states (3 in UT, 2 in WA, 1 in OR, 1 in CO, 1 in NE, and 1 in AZ). At this time, no source case for the outbreak has been identified, but it is likely that a traveler (or more than one traveler) who was infected with measles overseas visited one or both of the Disney parks in December during their infectious period. Disney and other theme parks are international attractions, and visitors come from many parts of the world, including locations where measles is endemic. The multi-state outbreak underscores the ongoing risk of importation of measles and the need for measles vaccine coverage. Measles was almost eliminated in the US in the year 2004 with only 37 reported cases. What are the signs of the Measles? Fever, cough, runny nose, conjunctivitis followed by a rash appearing first on the face then spreading to the rest of the body. Why is Measles so serious? Measles can cause severe health complications, including pneumonia, infection of the brain, and death. The Measles virus is extremely contagious. Measles can remain in the air of a room for 2 hours after the contagious person has left the area. People can spread the virus even before they know they are sick. Infected people are contagious from 4 days before their rash starts through 4 days afterwards. Measles is transmitted by contact with an infected person through coughing and sneezing. Every year, measles is brought into the United States by unvaccinated travelers (Americans or foreign visitors) who get measles while they are in other countries. They can spread measles to other people who are not protected against measles, which sometimes leads to outbreaks. This can occur in communities with unvaccinated people. Why have there been more measles cases in the United States in recent years? What can you do to protect yourself and your family from getting the measles? Check to be sure that you and your family members have received 2 doses of measles vaccine. You work in a hospital or other medical facility*. Before any international travel, infants 6 months through 11 months of age should have at least one dose of MMR vaccine. Children 12 months of age or older should have two doses separated by at least 28 days. Infants who receive a dose of MMR vaccine before their first birthday should receive 2 more doses of MMR vaccine. A: The measles vaccine is very effective. One dose of measles vaccine is about 93% effective at preventing measles if exposed to the virus and two doses is about 97% effective. A: Very few people—about three out of 100—who get two doses of measles vaccine will still get measles if exposed to the virus. Experts aren’t sure why; it could be that their immune systems didn’t respond as well as they should have to the vaccine. But the good news is, fully vaccinated people who get measles are much more likely to have a milder illness, and they are also less likely to spread the disease to other people, including people who can’t get vaccinated because they are too young or have weakened immune systems. A: No. People who received two doses of measles vaccine as children according to the U.S. vaccination schedule are considered protected for life and do not ever need a booster dose. Adults need at least one dose of measles vaccine, unless they have evidence of immunity. Adults who are going to be in a setting that poses a high risk for measles transmission, including students at post-high school education institutions, healthcare personnel, and international travelers, should make sure they have had two doses separated by at least 28 days. Q: Am I protected against measles? adult who was not vaccinated as a child and will be in a setting that poses a high risk for measles transmission, including students at post-high school education institutions, healthcare personnel, and international travelers. adult who was not vaccinated as a child and will not be in a high-risk setting for measles transmission. A: If you’re unsure whether you’re immune to measles, you should first try to find your vaccination records or documentation of measles immunity. If you do not have written documentation of measles immunity, you should get vaccinated with measles-mumps-rubella (MMR) vaccine. Another option is to have a doctor test your blood to determine whether you’re immune, but this option is likely to cost more and will take two doctor’s visits. There is no harm in getting another dose of MMR vaccine if you may already be immune to measles (or mumps or rubella). Q: How common was measles in the United States before the vaccine? A: Before the measles vaccination program started in 1963, we estimate that about 3 to 4 million people got measles each year in the United States. Of those people, 400 to 500 died, 48,000 were hospitalized, and 4,000 developed encephalitis (brain swelling) from measles. Q: Is measles a concern for the United States? A: Yes. Since measles is still common in many countries, this disease will continue to be brought into the United States. Measles is highly contagious, so anyone who is not protected against measles is at risk of getting the disease. People who are unvaccinated for any reason, including those who refuse vaccination, risk getting infected with measles and spreading it to others, including those who cannot get vaccinated because they are too young or have specific health conditions. Colds are the most contagious to others in the first 3-4 days of a virus. Staying home when you are sick is being considerate of others and yourself. Rest, take it easy, and drink plenty of fluids. It would be best to have your child sleep in a separate room from other siblings and play with her own set of toys early in an illness. Teach your child to wash his hands frequently especially before eating, and to not put her fingers in her mouth. Most colds last 7-14 days. Unfortunately there really is no way to make the virus go away more quickly. Vitamin C, Echinacea, and high dose vitamins have not been shown to boost your immune system and will not help you get better faster. Let’s try to treat your cold symptoms without using much medicine. The FDA has recommended that cough and cold medications not be given to young children and took them off the market because of side effects. Clear the mucous out of the nose by taking long, hot showers, running a cool mist humidifier (just as effective and safer than steam vaporizer). You will find that the symptoms are not as bad during the day. When your child is upright, the nasal mucous drains more easily. At night, elevate her head and give a cup of water to sip so she can swallow that postnasal drip mucous that causes her to cough. It is better to let the mucous flow. Do not give medications to dry up the nose. Acetaminophen or Ibuprofen help with aches and pains associated with colds. Get plenty of rest and set your expectations that most colds last 7-14 days and there really is no way to make the virus go away more quickly. Most colds start with fatigue and achiness for a day or two followed by nasal congestion and runny nose. This clear thin runny nose actually has more of a viral load than the thick green mucous that everyone worries about. Colds are the most contagious to others in the first 3-4 days of a virus so it would be best to have your child sleep in a separate room from other siblings and play with her own set of toys early in an illness. Days 3-7 are the worst days for the cough and yellow-green thick nasal mucous. Frequently this is when many consider using an antibiotic for a possible sinus infection, but we have found that green nasal mucous is normal at this stage of a cold. Clear the sinuses using nasal saline then blow or suction the nose. Whether or not you get sinus and ear infections depends a lot on how you are built – your anatomy. If the mucous can’t drain out of the sinuses or middle ears because these drainage areas are small or function poorly, the mucous accumulates, allowing a great place for germs to grow. This explains why some people get frequent ear and sinus infections and others easily get over their colds. Fever itself is not harmful, but may cause achiness and a headache. If the fever is not bothering your child, don’t let it bother you. However, in infants under 4 months old, fever can be a sign of serious illness and needs immediate evaluation. Usually a fever of 102 or more is enough to make your child uncomfortable. It is ok to give acetaminophen or ibuprofen (if over 6 months old) for a fever, but keep track of the dose and when you gave it. The height of the fever and whether or not the fever responds to medication does not always indicate how potentially serious an illness is. What is most important is how your child is acting. Will he smile at you? Will he read a book or watch a movie? If you feel your child is getting sicker quickly or is not responding to you normally, or the fever has lasted 2-3 days, please call our office. We have developed some concerns with our young patients going to clinics established at pharmacies or other walk-in clinics which don’t specialize in treating children. We feel we should point out that it is very important to keep in mind the level of expertise and training of the person evaluating your child’s illness. For most illnesses you can treat the symptoms and come to see us when the office opens at 7:30 AM or give our office a call if you have concerns about an illness. Recently the father of my patients informed me that he and his pregnant wife were planning a trip to the Caribbean. He was unaware of the risks of the Zika Virus activity in that area and the possible risk to his wife’s pregnancy. After we talked he changed his vacation plans and will not travel to an area at risk. Please read the following information so you can protect yourself and your children. The CDC releases updates on what is known about the Zika Virus. As of March 23, 2016, the CDC reports 273 Zika virus disease cases in the US but these are associated with travel outside the US. Of these cases 19 are pregnant women and 6 were sexually transmitted. There have been no cases where the Zika virus illness was acquired in the US. Zika virus can be spread by sexual activity. The Florida Department of Health has activated the Zika Virus Hotline 1-855-622-6735. Since May 2015, Brazil has experienced a significant outbreak of Zika virus. In recent months, Brazilian officials reported an increase in the number of babies born with microcephaly. In addition to microcephaly, other problems have been detected among fetuses and infants infected with Zika virus before birth, such as absent or poorly developed brain structures, defects of the eye, hearing deficits, and impaired growth. Although Zika virus has been linked with these other problems in infants, there is more to learn. Researchers are collecting data to better understand the extent Zika virus’ impact on mothers and their children. Are you pregnant or planning to get pregnant? Until we know more, CDC recommends special precautions for pregnant women. Women who are pregnant should not travel to any area where Zika virus is spreading. If you must travel to one of these areas, talk to your healthcare provider first and strictly follow steps to prevent mosquito bites during your trip. Although the Zika Virus has not caused disease in the US so far, mosquitoes carry other viruses that can cause disease. We need to be prepared in case Zika is found in the US in the future. Use Environmental Protection Agency (EPA)-registered insect repellents. When used as directed, these insect repellents are proven safe and effective even for pregnant and breastfeeding women according to the CDC. Remove or stay away from mosquito breeding sites, like containers with standing water. Patients diagnosed with the Zika Virus have had fever, rash, joint pain, or red eyes during their trip or within 2 weeks after traveling to an area where Zika has been reported. The CDC has guidance to help doctors decide what tests are needed for pregnant women who may have been exposed to Zika. Please call our office if you have any questions or concerns regarding the Zika Virus. By early February 2015, more than 100 people from 14 states have been reported to have the measles. Most of the cases are part of a large ongoing outbreak linked to an amusement park in California. At this time, no source case for the outbreak has been identified, but it is likely that a traveler who was infected with measles overseas visited the Disney parks in December during their infectious period. Disney and other theme parks are international attractions, and visitors come from many parts of the world, including locations where measles occurs often. • You had blood tests that show you are immune to measles, mumps, and rubella. • You are a man born before 1957. • You are a woman born before 1957 who is sure she is not having more children, has already had rubella vaccine, or has had a positive rubella test. • You already had two doses of MMR or one dose of MMR plus a second dose of measles vaccine. • You already had one dose of MMR and are not at high risk of measles exposure. • You are a college student, trade school student, or other student beyond high school. • You work in a hospital or other medical facility*. • You travel internationally, or are a passenger on a cruise ship. • You are a woman of childbearing age. Adults who are going to be in a setting that poses a high risk for measles transmission, including students at post-high school education institutions, healthcare personnel, and international travelers, should make sure they have had two doses separated by at least 28 days. Lactobacillus reuteri which is available as BioGaia Probiotic Drops. At the 28 day mark of taking the probiotics, the average crying time had decreased from 159 minutes a day to 51 minutes a day and 95% of the study participants had significant improvement in crying time. The American Academy of Pediatrics and the FDA released a warning 9.29.10 on the risks of Infant Sleep Positioners. The American Academy of Pediatrics (AAP) shares the concern of the Consumer Product Safety Commission (CPSC) and the Food and Drug Administration (FDA) on the safety of sleep positioners, and urges parents not to use these products. Infant sleep positioners are flat mats with side bolsters or inclined (wedge) mats with side bolsters. Now that school is in full swing, let’s look into what we can do to make each day flow more smoothly and to tackle some of the challenges school brings. BY PLANNING AHEAD THE NIGHT BEFORE. Have a regular place and time to study. Put a priority on homework. Turn the TV off until all homework is done. Let the TV be a reward for relaxing after working. Be consistent and your child will know that these rules are important. SET A REGULAR BEDTIME AND STICK WITH IT. A good night’s rest will lead to a better start the next morning. Sleep deprivation affects the ability to learn and recall information. A GOOD BREAKFAST STARTS THE DAY OUT RIGHT. Children who go to school hungry or get hungry before lunch have trouble concentrating and may be irritable and have headaches. Studies have shown that children who have sugary cereals or pancakes with syrup get hungry earlier and consume more calories throughout the day. 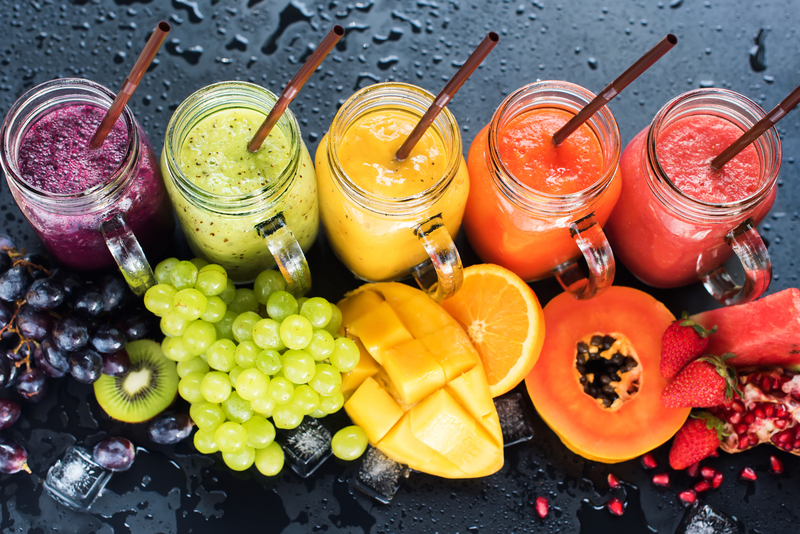 Try to have whole fruits like peaches or a banana instead of juice. Plan for proteins such as scrambled eggs and milk for breakfast instead of carbohydrates like bagels, waffles, and apple juice. A meal made of carbohydrates raises your blood sugar quickly and which is followed by a mid-morning drop in blood sugar that makes you hungry before lunch time and may make you eat more calories at lunch. SHOW YOUR CHILD HOW IMPORTANT HER WORK IS by taking the time to review it with her each day. Praise and rewards (and setting an example by being consistent yourself) will take you a lot further than criticism. BUT WHAT IF YOUR CHILD IS TRYING HER BEST AND NOT SUCCEEDING? If your children feel that you put a priority on school work and that it is important for them to do their best, they usually will do well…but what if they don’t. How do you change that around? Talk with your child and with her teacher as soon as you notice challenges with school.